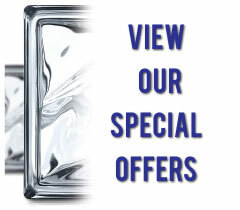 Quality Guaranteed - We offer a 10 year limited warranty on glass block installation. The glass block windows and ventilators, if any, installed under contract are warranted against defects in material and workmanship in fabrication and installation. This warranty is applicable only to the purchaser(s) under the terms and conditions set forth in the contract; this warranty cannot be sold, assigned or transferred. The installation of glass block windows and ventilators, if any, is warranted under the terms and conditions set forth herein for a period of ten (10) years from the date of installation. R.G.F. Industries, Inc. hereby expressly limits an implied warranties to a duration of ten (10) years. R.G.F. Industries, Inc. shall not be liable for any incidental or consequential damages whether based upon breach of warranty, breach of contract, negligence, any tort claim or other cause of action. Notwithstanding and without waiving the above limitations; in no event shall R.G.F. Industries, Inc. be liable for an amount in excess of the price of the aforesaid contract. Damages which result of negligent or intentional conduct of the purchaser(s) or vandalism are not warranted. To make inquiries regarding this warranty, contact us. If we determine that the inquiries are valid warranty claims under the terms and conditions set forth herein, it will repair or replace, at its discretion, any defective glass block or ventilator.